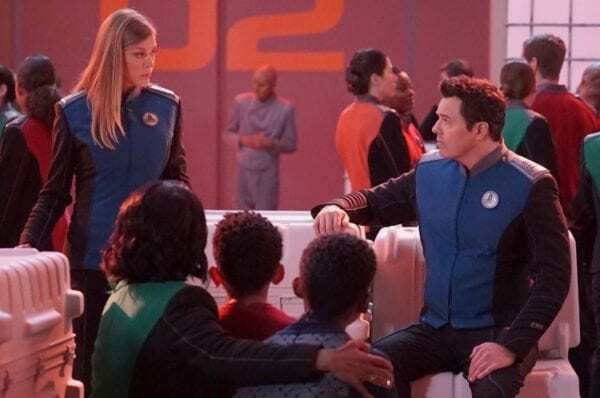 There is tangible loss in The Orville this week as life lessons are learned, Union space gets thrashed and unlikely allies team up for a one time deal. 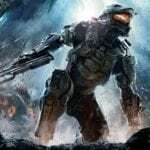 A series which is usually big on character also throws in some good old fashioned pitch battles and raises those stakes higher. Decisions are made, drama punches below the belt and we see some real grit and metal come through from a stricken crew. Seth MacFarlane is slowly developing Ed Mercer into an iconic character alongside everyone else on board. That personality which was so important in establishing this show is taking a back seat. New writers are steering the ship and Mercer is taking on a more rounded persona separate to his creator. Steely eyed and stoic under pressure this a character maturing on screen. Trapped under spacial house arrest and flanked by Kaylon garrisons left and right, this crew is operating under duress and Mercer must step up. There are a few cliched choices made while casualties and loss of life instil that all important sense of engagement. Comedic asides and chuck away punchlines are jettisoned in favour of full on collateral damage. People get shot, people die and Union ships are vaporised while the unwavering logic of Kaylon culture overshadows all decisions. Mallory and Kelly get their moment in the sun while everyone else is similarly given something significant to do. Chief amongst these is Isaac as portrayed by Mark Jackson who gives his Kaylon emissary shades of darkness underneath the silver chassis. Both non-conformist and slave to reasoned logic giving a sentient being more than mere shapes of depth requires skill. 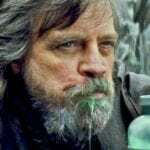 Beneath the space battles cultural tunnel vision and the limiting affect of intelligence, what shines through here is a person’s ability to grow and change. Isaac maybe from Kaylon but it does not define him, just as our choices belong to us and we can choose to be different from our ancestors. It is the basis of freedom across all races and genders whilst simultaneously demonstrating how intelligence has its own set of challenges. 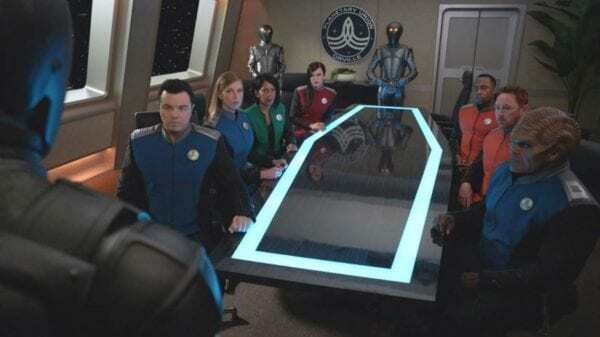 Few programmes ask these questions so frequently and fewer still with such dramatic eloquence, which is why The Orville remains genuinely special.